Glaro Incorporated shares how its highly regarded RecyclePro recycling receptacles have become known as the most diversified line of Quick Ship metal recycling receptacle products in the market. What may be considered a custom product at other manufacturers is standard at Glaro. The ability to “compose” your own receptacle starts with our easy ordering process. Every Glaro recycling receptacle is then produced to order. While many other manufacturers sell pre-made recycling products from stockrooms or require customers to place a custom order that can take weeks or months to ship, Glaro Inc. has built its reputation by empowering customers to essentially build their own recycling receptacles, without every placing a custom order. The manufacturer says that the key is the seemingly endless variety of designs and finishing options built into its vast RecylePro product line. “What may be considered a custom product at other manufacturers is standard at Glaro,” said Executive Vice President Robert Betensky in a recent interview. “The ability to “compose” your own receptacle starts with our easy ordering process. Every Glaro recycling receptacle is then produced to order.” The company says that its dealers can purchase recycling receptacles without delaying the shipment of their orders. That means dealers can get products to their customers faster. According to Glaro Inc., multiple sizes ranging from 12”, 15”, and 20” diameters are offered. 18” diameter half round recycling receptacles are also available for those seeking a more space efficient low profile design. Recycling units can stand alone as single purpose units or they can be connected to formulate recycling stations. In recycling stations the receptacles can be arranged in any order or layout. Glaro has become the go-to manufacturer for custom as well as standard, logos and messages, especially for companies who seek a distinctive, branded appearance on products placed in their buildings. Fortunately, Glaro Inc. provides unlimited options for silk screened logos and messages because each silk screen is handmade in-house. Special silk screen inks are then permanently baked onto the all metal fire safe receptacles. Silk screen messaging is superior to preprinted decals used by other manufacturers because Glaro silk screening does not deteriorate from cleaning chemicals, temperature changes, or peel like decals do. “We build products that last, down to the fine details,” added Mr. Glass. The amount of metal and powder coat finishes available and the ability to mix and match finish choices on the covers and bodies of Glaro recycling receptacles enables each customer to find a finish choice that is right for them. In fact, 29 textured and smooth powder coated finishes are available on all receptacles. Popular satin aluminum and satin brass metal finishes are also popular choices. “The customer may select the finish of the body and separately select the finish of the top cover to create a matching or contrasting look,” states Mr. Betensky. “It’s not just about our product selection. It’s about the level of care and attention that goes into manufacturing each one to insure the durability of our products. 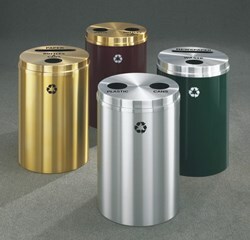 All recycling receptacles are scratch made and hand crafted in our New York factory. From beginning to end, we control quality,” says Mr. Betensky. All receptacles have the fastest shipping timelines in the industry. For more information, contact Glaro Inc. at (888) 234-1050 or learn more on glaro(dot)com. Glaro Inc. (glaro.com) is a leading USA manufacturer of commercial and consumer aluminum and steel products sold directly to distributors/dealers for almost 70 years. All products ship in 1 to 3 days. Product lines include bellman and luggage carts, platform trucks, metal trash receptacles, recycling receptacles, smokers’ posts and receptacles, crowd control posts and systems, safety barriers, signs, sign frames, directories, menu display stands, coat hanging equipment, coat trees, umbrella stands, wet umbrella bag holders, metal planters, and key drop boxes.